The Cities Alliance partnership is hosting an official Prepcom II side event that explores how partnerships of national governments, local governments and organised civil society are already contributing to sustainable cities. [9 April 2015] – Turning inclusive, safe, resilient and sustainable cities for all from an ideal into reality needs partnerships of dialogue and action. This message, which rings clear in the Joint Work Programme developed by the Cities Alliance in support to the United Nations Conference on Housing and Sustainable Urban Development (Habitat III), will be echoed at the Second Session of the Preparatory Committee for Habitat III in Nairobi from 14 to 16 April 2015. 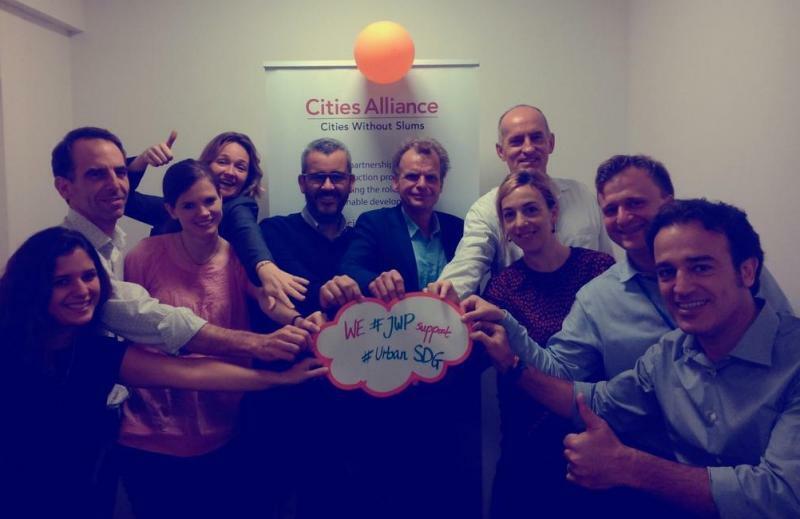 Highlighting the role of cities in development is the key aim of the Cities Alliance Joint Work Programme, which was established in 2013 to prepare inputs to the Habitat III Conference and determine priorities and messages to the Post-2015 Agenda. Consisting of nine Cities Alliance member institutions, the group seeks to maximise impact through collaboration and joint activities, including at the Second Session of the Preparatory Committee. An official side event on 14 April, organised by all members, will explore in practical terms how partnerships of national governments, local governments and organised civil society are already contributing to sustainable cities. Mauricio Rodas, Mayor of Quito, and Michael Müller, Governing Mayor of Berlin, will participate in the session to provide insight from a local authority perspective. “This Prepcom occurs at a very opportune time, in advance of the General Assembly’s deliberations on the Sustainable Development Goals in general, and the historic opportunity offered by a Goal on Sustainable Cities in particular. As more and different players focus their attention on cities, the need for open and constructive partnerships will become more important than ever,” said William Cobbett, Cities Alliance Director. Habitat III, to be held in Quito in 2016, will bring together Member States to shape a New Urban Agenda focusing on policies and strategies for urbanisation. In 1996 the international community met at the Habitat II conference in Istanbul to decide how to promote adequate shelter and sustainable human settlements for all, through a dedicated Habitat Agenda. Habitat III will assess its commitments, 20 years on, and decide how relevant sustainable development goals will be supported through sustainable urbanisation. The rapid rate of urbanisation since 1996 calls for an ambitious agenda for sustainable cities and effective partnerships to make this happen. The statics set the stage: 95% of global population growth takes place in cities; between 2000 and 2030 the urban population is expected to double, with the most significant growth happening in secondary cities; 80% of global Gross Domestic Product is produced in urban agglomerations, while 70% of global carbon emissions are generated in cities. At the same time, prevalent inequalities in cities cause an “urbanisation of poverty”, which affects women and young people in particular. In fact, the absolute number of slum dwellers is growing, particularly in Sub-Saharan Africa and South Asia, with the vast majority of them under the age of 24. Against this backdrop, Habitat III is a perfect opportunity to be the first global platform to focus on the implementation and modalities for achieving the Sustainability Agenda in the Global North and South, following the adoption of the new Sustainable Development Goals, including Goal 11 on Sustainable Cities. “By collaborating through focused partnerships such as the Cities Alliance, different organisations have the opportunity to learn from and influence other partners, and ensure that cities and their citizens receive the most efficient and effective support,” noted William Cobbett. “As more and different players focus their attention on cities, the need for open and constructive partnerships will become more important than ever”.